Not just any cupcakes, either. These are the creamiest, dreamiest, fluffiest, crunchiest cupcakes you could ever cram into your pretty little mouth. And Oreos themselves to really drive the point home. The plan was epic and so was the result. Everyone went NUTS over these. Absolutely nuts. People gasped when they saw them at the shower. My family clamored for extras. They were devoured and loved and are highly recommended. Do yourself a favor. It’s Friday! Heat the oven to 300 degrees. Line a baking sheet with parchment or Silpat and set aside. Preheat your oven to 350 degrees. Line 3 standard cupcake tins with liners. Set aside. Mix dry ingredients in the bowl of your stand mixer. Whisk the wet ingredients together in a separate bowl. Pour the wet ingredients in with the dry and beat on medium speed for 2 minutes or so. Scrape the bowl down and beat for another minute until well blended. 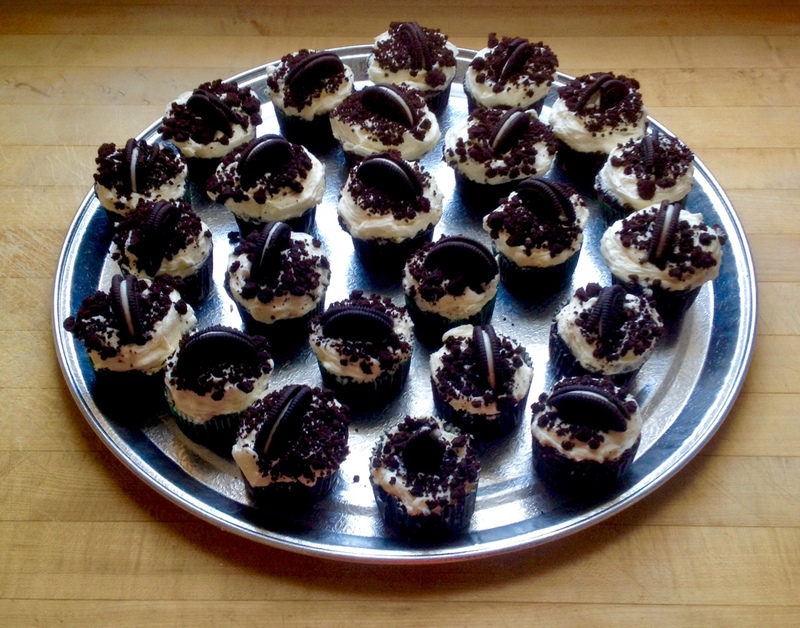 Pour batter into prepared cupcake tins and bake for 18-20 minutes or until just set on top. I rotated my pans half way through baking time. Do not overbake. When done, take cupcakes out of the oven and cool for about a half hour. Remove from pans and cool on wire rack for another half hour. Cool totally before frosting. Combine the butter, shortening, and cream cheese in the bowl of a stand mixer fitted with the paddle attachment and cream together on medium-high for 2 to 3 minutes, until the mixture is smooth and fluffy. Scrape down the sides of the bowl. With the mixer on its lowest speed, pour in the corn syrup and vanilla. Crank the mixer up to medium-high and beat for 2 to 3 minutes, until the mixture is totally smooth and a glossy white. Scrape down the sides of the bowl. Add the powdered sugar, salt and baking powder and mix on low speed just to incorporate them into the batter. Turn the speed back up to medium-high and beat for 2 to 3 minutes, until you have a smooth, bright white frosting. When the cupcakes are cooled, frost them and dip them into the cooled chocolate crumbs. 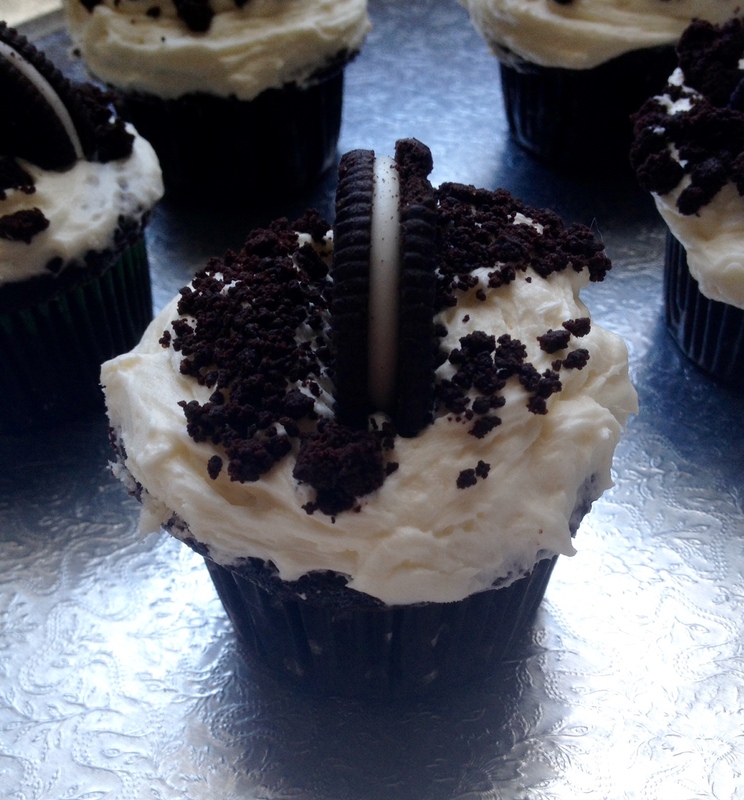 Stick half an Oreo on top of each cupcake. Chocolate Crumb and Frosting recipes are from Momofuku. Cupcake recipe from Snickers Cake.